The Voila mattress is another of the newcomers to the online mattress industry. They don’t have any storefronts – they are able to pass on considerable savings to consumers by cutting costs and shipping direct. The company has been part of the foam mattress revolution, in which many small entrants have made names for themselves in the once exclusive foam mattress industry. But Voila is actually a hybrid mattress – it is made from both foam and coils. This review will take a look at all the different aspects of the Voila mattress – you should be well equipped to decide if this is the right mattress for you after you read this article. Should I Buy the Voila Mattress? As mentioned previously, the Voila mattress is a hybrid between a coil and foam mattress. It uses both components to create a unique sleeping experience for those who own the mattress. The mattress is actually three separate layers – it also has an outer shell that is in place to provide additional edge support and general firmness. We will explore each of these layers in further detail below. Top – This part of the layer is made from foam. 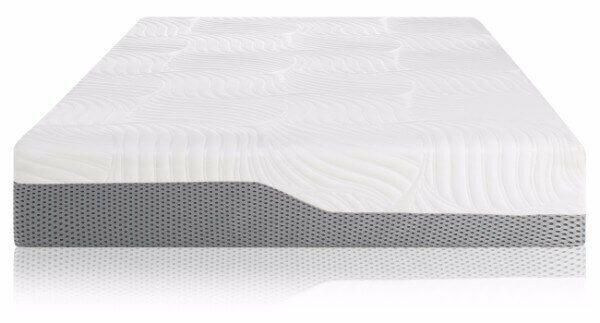 Voila uses a unique gel memory foam that has all the qualities of traditional memory foam, minus the heat retention. This layer prioritizes comfort and ensures that you have an enjoyable first point of contact with the mattress. Second Layer – This layer is made from another piece of custom foam. 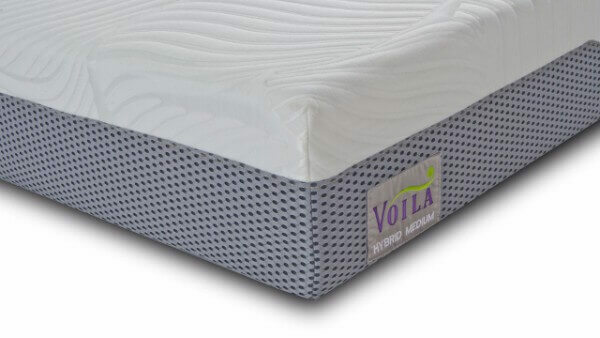 Instead of memory foam, Voila has made the second layer from a latex foam which provides additional responsiveness. This layer is also much better at dissipating heat than traditional memory foam. Bottom Layer – This is where the coils come into play. This layer is manufactured using pocketed coils – which are great for provided support and minimizing motion transfer. This part of the mattress provides the foundation for the other layers. Outer Shell – As mentioned in the construction section, the mattress has an outer shell to help provide additional edge support. This outer shell is made from a high-density poly foam. It really improves the overall support of the mattress and makes sure there is added consistency. A – Exterior Cover – This is the cover that is used to protect the mattress. B – Fire Sock – Made from Silica, in place to prevent flames spreading in case of a fire. C – Gel Memory Foam – The initial layer of gel memory foam that is in place to provide comfort. 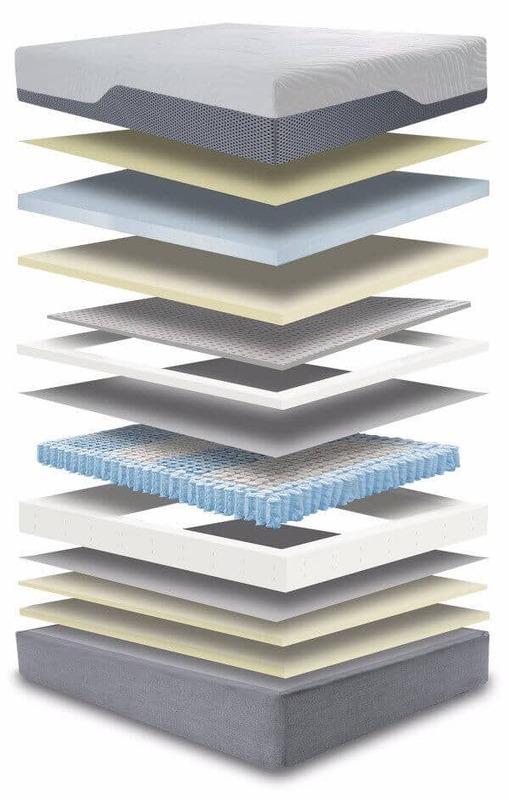 D – Gel Memory Foam (2nd Layer) – Another layer of gel memory foam that is in place to provide as much comfort as possible. E – Latex Foam – Another layer of foam that provides comfort and adds to the overall breathability of the mattress. F – Edge Support Foam – A standard foam used to ensure the edges of the mattress are stable enough to support pressure. G – Support Foam – An additional layer of support that is used as a buffer zone between top and bottom layers of the mattress. H – Fiber Insulator Pad – This protects the pocketed coils in the layer below. I – Pocketed Coils – These provide support for the mattress, as well as a bit of bounce and resistance. This is the coil portion of the mattress, which makes this a hybrid design. J – Fiber Insulator Pad – Protects coils and allows air to flow through the mattress to enhance breathability. K – Support Base Foam – High-density foam that enhances the support of the mattress. 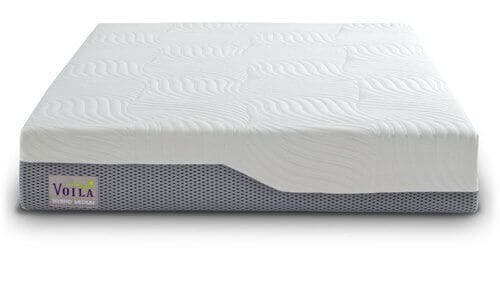 L – Additional Support Base Foam – Another piece of high-density foam that provides the last line of support for the mattress. As you can see, the overall design of the mattress is extremely complex. The advanced manufacturing techniques that have been used to create this mattress are part of the reason it has been so successful – it truly provides you with a unique sleeping experience. The cover of the Voila mattress follows the traditional route that many new mattress makers are taking. Most new mattresses on the market have ditched complex and thick cover designs and have taken more minimalist approaches. The Voila mattress cover is made from polyester – it provides the needed breathability that foam based mattresses require. A thick cover would only increase the amount of heat retention. The surrounding sides of the cover are actually made from a mesh like material which allows air to flow through the mattress and reduce heat buildup. As you can see, a great deal of effort has gone into constructing this mattress. Now that you have a good understanding of what’s inside the Voila mattress, it’s time to discuss how it feels. We’ve been testing the mattress to determine the comfort and support levels it provides people who sleep on it. When you think of a mattress, you typically think of comfort – or how soft it feels – but support is just as big of an issue. You probably don’t realize it, but support largely determines the quality of sleep that you will get. Many people sleep on unsupportive mattresses their entire lives and end up creating bad sleeping habits and back problems – this is never a good idea. According to our results, the Voila comes in at around a 6/10. This means that it has just above average support levels. This is the perfect mattress for someone who weighs a normal weight. If you weigh above 250 pounds, this will most likely not allow you to sleep in a comfortable position. Fortunately, Voila also has a softer and more firm version of the mattress which ensures that people with different sleeping preferences can still enjoy their design. It’s rare that you find a mattress provider that offers different versions of the same mattress design – Voila has done well to make their signature mattress available to a wide range of clientele. Because Voila is a relatively new entrant to the market, there haven’t been a great deal of changes to the design. They did recently introduce three versions to appeal to a wider variety of clientele, which has been the biggest update they’ve had since their initial inception as a company. Sinkage is another characteristic of a mattress that you should consider when you are going to purchase one. This will show you how much hug or contour the mattress will provide you with. People have their own preferences on sinkage, so it’s important to understand what level of contour you and your partner are looking for in a mattress. As with any mattress purchase, whether you should buy the Voila or not comes down to personal preference. One of the great things about the Voila is that it comes in three different support editions – you don’t have to settle for a level of support or comfort that you don’t want. That’s why it’s important to talk with your partner about the level of support you’re looking for. If you want a hybrid mattress design, this is definitely one of your best options. The coil system allows for additional breathability – the mattress does a great job of preventing too much heat retention. Those who typically overheat during the night will find this mattress enjoyable. The mattress lets you have the comfort of memory foam without the drawback of overheating. The mattress is a great price, and the free shipping included with the purchase ensures that you don’t have to worry about extra hidden fees. You can also return the mattress within the first 100 days of purchase if you’re not satisfied. If you don’t feel that the Voila is the right mattress for you, don’t worry – there are plenty of mattresses on the market within a similar price range. In addition, there are also a number of high-end mattresses available for even cheaper than the Voila mattress. Check out some of the other reviews on our website if you’d like to find out more about some other awesome mattresses on the market!